According to WHO, 10% of the world population suffers from addiction to alcohol or drugs, which are among the top causes of preventable deaths worldwide. Moreover, alcohol and tobacco are often used together: Studies have found that people who smoke are much more likely to drink, and people who drink are much more likely to smoke. 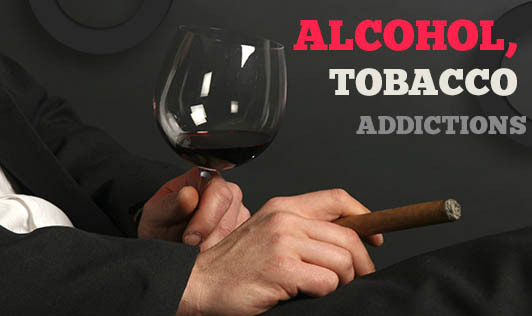 People abuse substances such as drugs, alcohol, and tobacco for varied and complicated reasons. Abused substances produce some form of intoxication that alters judgment, perception, attention, or physical control. People cite many reasons for using tobacco, including pleasure, improved performance and vigilance, relief from depression, curbing hunger, and weight control. The primary addicting substance in cigarettes is nicotine. But cigarette smoke contains thousands of other chemicals that also damage health. Hazards include heart disease, lung cancer, and emphysema, peptic ulcer disease, and stroke. Withdrawal symptoms of smoking include anxiety, hunger, sleep disturbances, and depression. It lessens your inhibitions, slurs speech, and decreases muscle control and coordination, and may lead to alcoholism. Withdrawal from alcohol can cause anxiety, irregular heartbeat, tremor, seizures, and hallucinations. Alcohol is the most common cause of liver failure and can also cause heart enlargement and cancer of the esophagus, pancreas, and stomach. Treatment is now available for those who want to stop smoking and/or drinking. Contact your family physician for more help and advice.